California fire authorities listed 82 active fires burning across the state, with the worst devastation in the Wine Country, where nine major fires have burnt over 84,000 acres, causing at least 15 deaths and leaving 240 residents missing. The Wine Country may catch a break this week as clouds roll in. Temperatures are expected to fall from a high of 82 degrees Fahrenheit on Tuesday to a high of 77 degrees — and an almost record nighttime low of 38 degrees — on Wednesday. The Diablo winds that gusted to over 68 miles-per-hour on Monday and funneled down mountain passes and canyons have subsided. Tuesday saw 12 miles-per-hour average winds, with gusts of 22 miles an hour. The cooling trend is expected to last through Saturday. After that, temperatures will spike to a high of 84 on Sunday, according to AccuWeather. Only one Wine Country fire was contained by 5:00 pm PDT Tuesday. But firefighters contracted to bring in their ultimate weapon Tuesday afternoon — the world’s only 747-400 Supertanker (Tail number 944) — swept in to dump 19,600 gallons of fire retardant on each pass. Cal Fire has contracted the plane, to be based out of McClellan Air Force Base near Sacramento, for at least the next 10 months. To put 944 in perspective, Cal Fire operates the largest firefighting aviation fleet in the world, composed of 14 OV-10A quick response scout aircraft; 23 Grumman S-2T airtankers that can each drop 1,200 gallons of water; and two 11 UH-1H Super Huey helicopters that can drop about 600 gallons of water each. Vice President Mike Pence, who has been in the state for a $5 million fundraising swing, visited the California Office of Emergency Services near Sacramento on Tuesday. 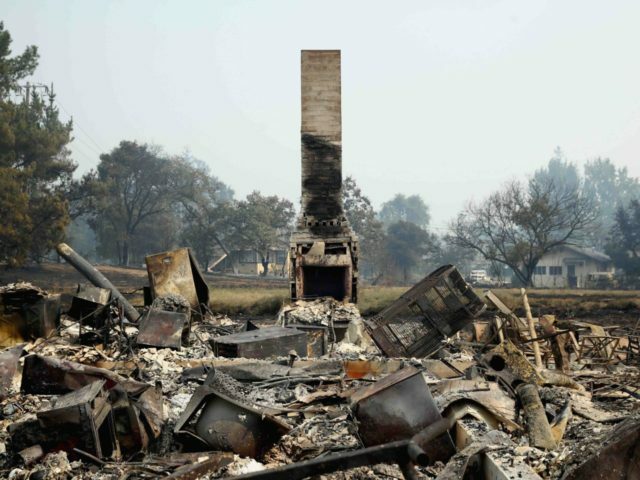 He also called California Governor Jerry Brown to assure that the Trump administration is monitoring the situation and has directed the Federal Emergency Management Agency to approve federal fire assistance grants. He emphasized that the administration is committed to providing public assistance to help the county and city governments when they are ready to rebuild. It is believed that at least 20 of the region’s 650 wineries have been severely damaged or destroyed. Federal, state and local fire authorities have put 2,500 professional firefighters on the Wine Country fires. It is believed that at least another 500 volunteer firefighters have joined the battle. The San Jose Mercury News reported that Napa and Sonoma Counties have suffered over 1,000 more wildfires this year than in 2016, with over 225,000 acres burned since January 1. The National Interagency Fire Center 2017 incident count for the Western states’ first nine months of the year was 50,000 fires, which have burned over 8.5 million acres. That is more than double the number in the first three quarters of 2016.